As an accomplished trainer and speaker, I’ve spoken in front of audiences as large as 8,000 people. I have a gift for bringing an audience to their feet with excitement in one moment to wiping tears from their eyes with emotion the next. Almost 60% of Americans do not have $500 to take care of an unexpected expenditure. It was clear that even families who were truly dedicated to getting out of debt did not have a decent budgeting tool to help them achieve their goals. My wife and I struggled financially! Families needed something that replicated cash envelopes without being required to use physical cash. Let's face it, we live in a cashless world--there are too many logistical nightmares created by using cash. So, we created digital envelopes and connected them to a special debit card where budgeting is as easy as spending. As the Executive Vice President and Chief Marketing Officer of ProActive, I am helping to bring the cash envelope budgeting system into today's world with a digital tool that will work for everyone. The world of personal finance continues to gloss over the controlled spending pillar because there has never been a scalable way to make money by helping people budget and get out of debt. 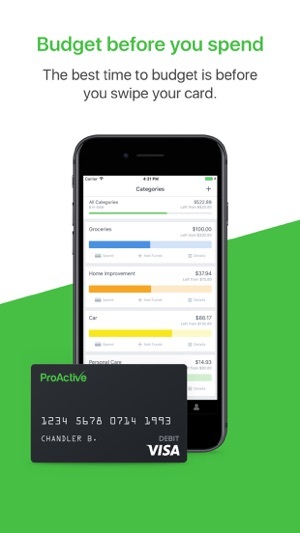 ProActive is the only system in the marketplace that connects budgeting, spending, and automated debt elimination in the palm of one’s hand. My dream is to help millions of families across the globe rise above the paycheck-to-paycheck grind and eliminate debt permanently. - What is your story? - What makes ProActive different from other budgeting systems? - Why does the marketplace need ProActive? - Why is budgeting so tough for people? - How does ProActive help people overcome mental blocks? - How do you see ProActive Budget changing the personal finance space? - How are the financial planning, mortgage, and financial wellness industries going to be able to plug into your future? - Why do you feel your team is the right team to bring the digital cash envelope system to the marketplace? - How can people connect with you?